During the late 1930's the company had several factories. 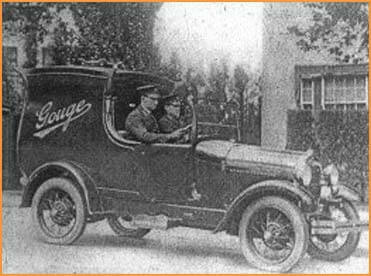 A laundry service was added in 1938 and served five city shops, twenty four suburban outlets, fifty five agencies and an extensive delivery service. In 1942 the first four hour plant was established in a warehouse operated by Myers, Australia's largest department stores. 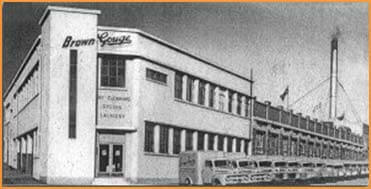 In the fifties the company continued in the forefront of the dry-cleaning industry and established the first suburban one hour processing plants in 1959. The Brown Gouge Group today operates Victoria’s largest chain of on-site dry cleaning stores which also supports an expanding network of contract sites and agents. The Brown Gouge name today is synonymous with Quality of Service and Expertise in all facets of the dry cleaning and laundry business. The Brown Gouge Group also includes a commercial Laundry operation and city-based hotel valet house which services the dry cleaning and laundry requirements of Melbourne’s hotel guests and a range of organizations. Brown Gouge is a vibrant, growth orientated company that is committed to excellence in the ever-expanding service industry of dry cleaning and related fields. As a step towards extending our services across Australia, our first store in Queensland was opened at Toowoomba. Brown Gouge, a leading provider of laundry and dry cleaning services to commercial and domestic customers recognise the importance of providing services which meet the requirements and expectations of its customers and the market in general. It is the company’s aim to supply its customers with cleaning services of a consistent quality which not only conform to previously agreed standards and specifications, but that also are suitable for their intended purpose. The company also aims to provide customer satisfaction at all times, and to this end it is committed to providing a level of service quality and customer service, which meets both the expectations of the customer and the company’s corporate objectives. for 100 years in 2015!